A 68-year-old man has died after the school bus he was driving was involved in a crash with a lorry and car on the outskirts of Aberdeen. The accident happened on the B979 South Deeside Road near Maryculter Bridge at about 07:45. There were 13 children on the bus, of primary and secondary age. They suffered only cuts and bruises. The bus involved was carrying pupils from Lathallan private school in Johnshaven. Police Scotland appealed for witnesses. The male drivers of the DAF lorry, aged 56, and red Audi A4, aged 40, were taken to Aberdeen Royal Infirmary. They were not thought to have suffered life-threatening injuries. 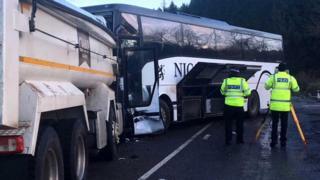 Insp Neil Morrison said: "Sadly the driver of the coach died of his injuries at the scene. "The 13 on the coach were not seriously injured. They have been reunited with their parents. "Any collision of this nature is traumatic and out thoughts are with those involved." He added of the road conditions: "It's been cold, the road surface is a consideration for us." Lathallan headmaster Richard Toley said: "We have been informed by Police Scotland that the driver has sadly passed away. "Our thoughts and prayers are with his family, he was a larger than life character who was extremely popular with our pupils. The road between Leggart Terrace and Netherley Road has been reopened.